As summer ends, you may notice that your wooden fence isn’t looking as solid and strong as it used to. You may think that it just looks a little lacklustre and that it just needs a coat or two of paint to be back in tip-top shape, but there might be more to the repairs than you think. If you suspect your fence may be in need of help from some professional fence contractors, then you’ve come to the right place. Keep on reading to learn about telltale signs that’ll warn you that you need a new fence installation sooner rather than later. If you notice your fence leaning or sagging in any direction, then it’s probably an indicator that the foundation has been compromised and can no longer support the full weight of your fence. While a botched installation can have something to do with this, leaning and sagging can occur naturally when your fence has aged considerably. Fences with rot or significant insect deterioration are typically irreparable, and need to be replaced completely. Damage caused by insects can include holes, or even a collapsing fence. If your wooden fence has suffered because of insects and you`re looking to avoid that headache the next time around, you might want to look into chain link, PVC, or even aluminium fencing. Holes, cracks, and splintering of the wood may seem like small aesthetic flaws, but they can be signs of a larger underlying problem. When you start to notice holes, no matter how tiny, you can be sure that there’s much more damage beneath the surface that you can’t see yet. The same goes for cracks and splits—they may seem like a minor problem, but they’re signs that the wood has weakened and will likely begin falling apart soon. Missing parts of your fence can pose a serious safety risk for your family, and should be addressed as soon as they’re noticed. Wood swells and contracts naturally over time, which can cause connections to loosen. In addition, rust can contribute to the loss of fasteners or nails, and rot can cause the wood to split or decay right around the fastener. Whatever the reason, you should have a contractor assess your fence and have them advise you on the best way to repair or replace it. 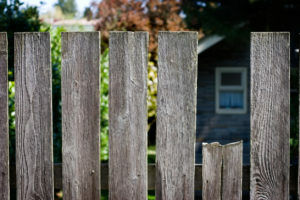 If there are minor damages to a small portion of your fence, then it may be salvageable with some repairs. However, you should always consider the long-term value of your repairs—for example, if you anticipate having to replace a small section each year, you might be better off replacing the entire fence at once as it could end up being a lot cheaper that way. If you’re looking to repair or replace your fence, all you need to do is call Total Fence Inc. We offer a wide array of fencing options that can be customized to fit your specific needs. From commercial fencing to residential fencing, and even decks and custom carpentry, we do it all. You can rest assured that our professional staff will use the highest-grade materials, and ensure your home improvement project gets done right. Call us today for more information.